Turkey's TÜRKSAT 5A and 5B satellites will be launched by Space Exploration Technologies (SpaceX), this according to Turkish Transport Minister Ahmet Arslan. "Our friends decided to launch our satellites with the Falcon 9 rockets of Airbus' subcontractor, SpaceX," Arslan added during the 3rd Global SatShow in Istanbul. 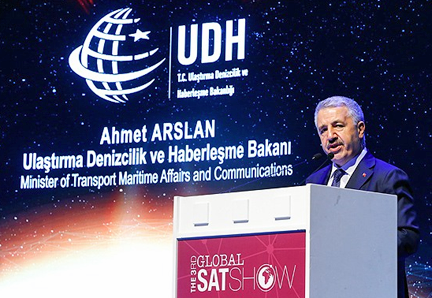 The agreement to build and launch satellites will be worth around $500 million, the Chairman of Turksat said during his speech at the same event. Elon Musk, the CEO of aerospace company SpaceX, met President Tayyip ErdoÄŸan in Ankara on Wednesday and discussed cooperation between Tesla, SpaceX and Turkish firms. Musk's SpaceX plans a manned mission to Mars by 2024 and a rocket capable of carrying passengers from one continent to another in less than an hour. Article source: Turkishny.com, authored by Ä°ngilizce Haberler.